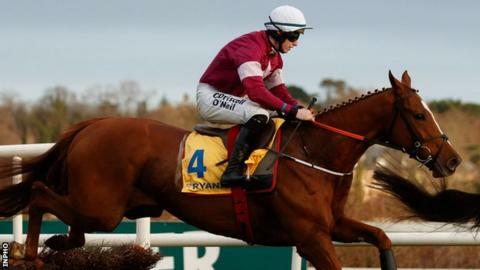 Samcro has been ruled out of a return to the Cheltenham Festival next week by trainer Gordon Elliott. The impressive winner of last year's Ballymore Novices' Hurdle was found to be suffering a lung infection over Christmas. "He's in very good form and I am pleased with how he has been doing in his work over the last few weeks," Elliot told his Betfair blog. "However, Cheltenham is just going to come a week or two too soon." Samcro has been defeated in all of his four races since the victory at the 2018 Festival. Elliott had been considering a step up to three miles for the Sun Racing Stayers' Hurdle having already ruled out a crack at the Champion Hurdle. But the Gigginstown House Stud-owned seven-year-old will now bypass the meeting entirely. "Unfortunately we are going to have to skip Cheltenham with Samcro," added Elliott. "At the best of times you've got to be absolutely spot on for Cheltenham and while Samcro is in very good shape myself, Michael and Eddie (O'Leary) feel that the right thing to do by the horse is to give him more time. "There is every chance that Samcro could run again this season and there are a range of suitable races for him at those meetings so hopefully we will see him back in action next month." Samcro has long been seen as a potential star over fences - and Elliott confirmed he will go chasing next season. He said: "Looking further ahead, we are looking forward to when he goes chasing in the autumn."